Snow falls at Ronald Reagan Washington National Airport on Wednesday, Feb. 20, 2019. 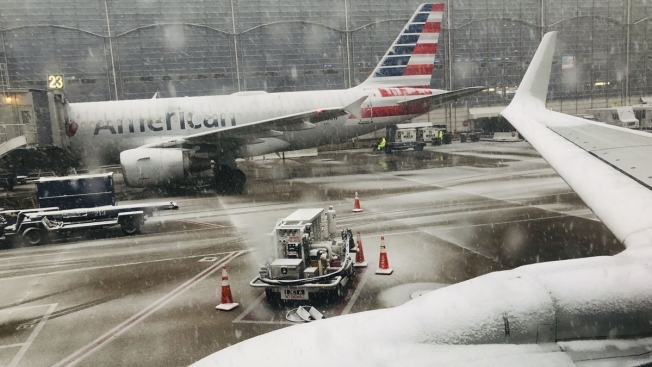 Airlines canceled more than 1,000 flights on Wednesday as a mix of snow, sleet and heavy rain crossed the U.S.
American Airlines said it canceled 400 flights scheduled to depart Wednesday, mostly those on smaller, regional aircraft. American and other carriers, including Delta Air Lines, United Airlines, JetBlue Airways and Spirit Airlines said they would waive date-change fees for travelers scheduled to fly to or from airports affected by the storm if they can travel later this week. Southwest Airlines, which doesn't charge date-change fees, said it wouldn't charge travelers the difference in fare if they changed their travel date flight due to the weather. Federal forecasters expect the Washington, D.C,. area to receive up to 6 inches of snow Wednesday but that precipitation will change to ice and then rain, creating a messy evening commute. More than 800 flights scheduled to fly in or out of the three main airports that serve D.C. were canceled, according to flight-tracking site FlightAware. The New York City area is forecast to receive less snow and also a wintry mix followed by rain. Airlines called off about 300 flights to and from the metropolitan area's three main airports. You got bumped. Here's what airlines owe you from CNBC. Elon Musk tweeted, then revised, Tesla financial guidance. He probably shouldn't have.